Top Chef season 10 heads to Seattle, where I’m sure we’ll see a salmon challenge at some point and at least one guest judge wearing flannel. 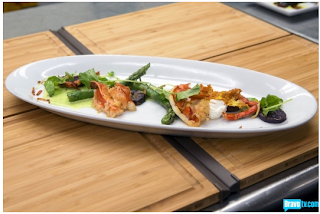 This season 21 cooks compete for that coveted feature in Food and Wine magazine, a showcase at the Annual Food and Wine Classic in Aspen, $125,000 provided by Healthy Choice (maker of the ironically titled product - Top Chef Frozen Foods) and of course, the all important title of Top Chef. 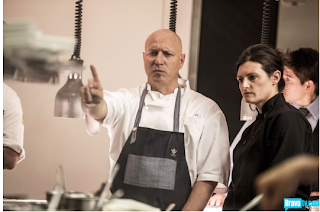 The never-aging Padma Lakshmi and Papa Bear Tom Colicchio host the show and lead the judging table that, here in Seattle, will include James Beard award winner Hugh Acheson and culinary “superstar” Emeril Legasse. Legasse has apparently been downgraded from his previously credited 'legend' status because this season the Top Chef producers have also brought in “Legendary Chef and Restaurant pioneer,” Wolfgang Puck. At this rate Escoffier himself will show up and judge Top Chef Season 20. As per usual for the past few seasons, we start with an “amuse-bouche” round, a little something to get your appetite going before heading to Seattle. The 21 'cheftastants' get split up into 4 groups and head to each chef judges’ restaurant for a “personally designed challenge” to decide who gets to move on. 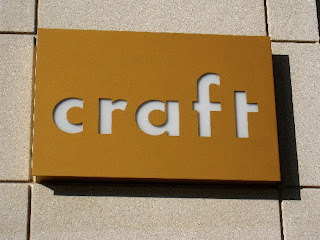 We start off at Tom Colicchio’s Craft Los Angeles. Then there’s Accent lady, Mustache guy, Ethnic guy, and the Chubby guy who is already sweating. Don’t worry. They’ll get names if they make it through. Names are for closers. We see the immaculate kitchen at Craft, and the chefs begin to mingle and get comfortable with their environment. Tom calls this a "little" kitchen, which like calling Tom a "little" terrifying. 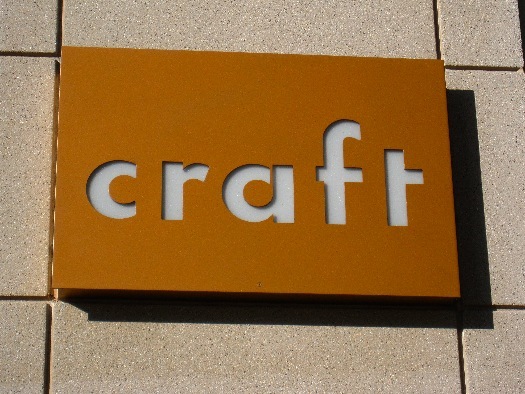 Craft's kitchen is one of those airy, cathedral-like spaces where everything seems shiny and spotless. Tasks are given. Right away Chubby guy is in trouble. “Do you always butcher with a paring knife?” Tom asks. Cubby guy obviously never watched the show. If Tom is ANYTHING he is a stickler for terms and formality. Don’t call it coq au vin if it’s not a old rooster, a paella needs to have a charred bottom crust, and always peel the skin off red peppers. Oh did I mention Chubby guy is now flop sweating? Ethnic guy is literally butchering this fish. Sigh. Justo would be sad. Mustache guy was over-confident and despite having a reputation of being a butcher...hacked up the chicken without asking Tom how he wants it done. Not good. Exotic guy is half Chinese, half Norwegian German. He’s confident that his globe trotting experience would earn him a spot. Because you know, having been to Ethiopia makes you an expert in cooking Ethiopian food. 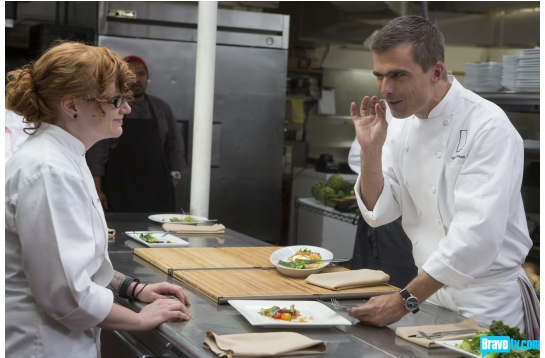 He and Tattoo cook #2 were on screen cooking side by side briefly. They would make beautiful dishes together. Alas, he doesn’t cook that direction. Not that there’s anything wrong with that! I digress. 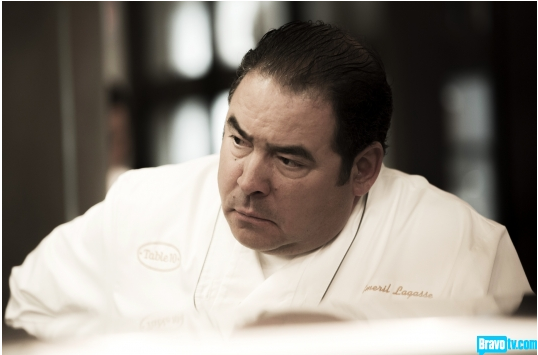 Emeril’s playing it close to the vest. Some criticism here and there but nothing too harsh. Being the super nice guy that he is, he always counters a criticism with a balancing praise. Kristen Kish (Model cook/Tattoo Cook #2) moves on with her English Pea broth with lemon peel (poached three times!) diced apple, scallops, crème fraiche. 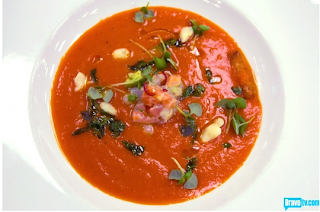 Jeffery Jew (Exotic cook) gets an instant nod by pulling off a chilled watermelon tomato gazpacho, peppers and ceviche. Joshua Valentine (Mustache guy #2) passes with a roasted corn and coconut soup with mussels. All three soups look delicious. Emeril is right! The soups does give us a glimpse of the chefs' personalities. 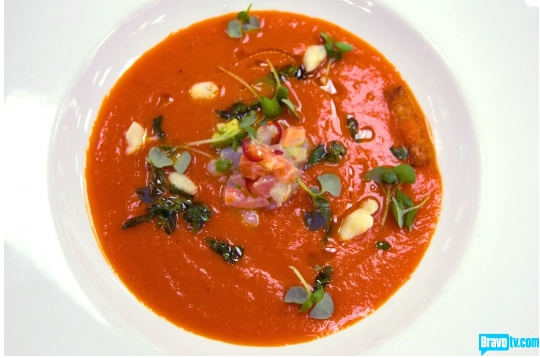 From Josh’s heartiness with the corn, to Kristen’s deftly executed pea broth, to Jeffery’s bold and daring chilled gazpacho. All three could be serious contenders. Red Shirt cook and Tattoo cook #1 get left behind. Sadness ensues. Back in LA with Tom. Service time. Tom wants to see how the cooks react in real life situations. For me this was obviously the most challenging test. It’s basically 3 tests in one. Tom’s been here since day one so he knows exactly what situations the contestants will have to go through throughout the course of the season. You pass this test and you’ll have a leg up on the others. I'm not a contestant. I work here. Right away John Tesar gets the nod. The guy’s been cooking since the 80’s and obviously got chops. 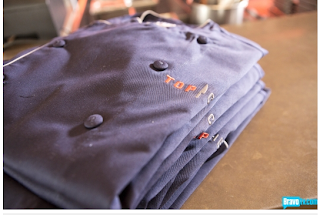 Tom gives him a hearty bro-shake and sends him off to grab a Top Chef coat. If John can keep his temper down (big IF) and focus on cooking, he is clearly an early favorite. Others are hoping that John already got booted. Not the case. Chubby guy is now both figuratively and literally sweating. Off to Beverly Hills and restaurant Cut. 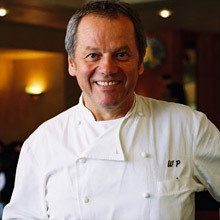 Ladies and gentlemen, the Legend himself, Wolfgang Puck. The task here: omelet. Many chefs have said that the way to judge a cook is by how they make an omelet. I could cite sources but if you haven’t heard that before you’re probably not reading this recap. They have 45 minutes to make an omelet. 45 mins! According to Culinary Yoda Jacques Pepin, a perfect French omelet takes just a few minutes to make. This better be one freaking good omelet. The group here is a bit nondescript, save for the dramatically accented Carla Pellegrino (of the famous Rao’s, featured in Top Chef Season 8: All Stars) and Kuniko Yagi, whose black chef’s coat and straight dark hair makes her look like the villain in a Japanese horror movie. Everyone rushes around trying to make the most complicated omelets ever. He did. He’s also the only guy who got sent home. Apparently having “the number 1 restaurant on Yelp after being open for 11 months” couldn’t save his bacon-greased eggs. Seasonal Pantry is a great place and serves delicious food, but that origami comment and his smugness about Yelp was a little off putting. I gotta say. Tom Colicchio would have sent ALL OF THEM home for the plates they dare called “omelet.” All except for Crissy Camba who presented an actual omelet, the rest were over done scrambled eggs hidden underneath salads. Wolfgang did have the quote of the episode, “A stove is like a woman, it never does what it’s supposed to do.” Wow, way to remind us that you're old-school Wolfgang. Expect lots of zingers from this “legend and restaurant pioneer” this season. Let’s head to Atlanta, Empire State South where Top Chef Master darling Hugh Acheson rounds up the final group of 5 chefs. Hugh also describes his test as one he gives all his cooks - 45 minutes for a composed salad. Apparently if you know how to make soup, omelet, and a salad then you are all set getting a job in a Top Chef caliber kitchen! The standouts here are Hawaiian chef Sheldon Simeon and Brooke Williamson. 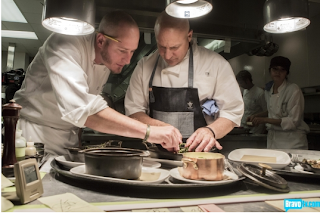 Sheldon is a People’s Best New Chef Pacific Northwest by Food and Wine magazine. Yeah, he might know his way around the ingredients from and around Seattle. Advantage Sheldon. Brooke Williamson, the lovely girl next door heavily tattooed mommy got the instant nod for her fried kale salad with brussels sprout leaves and lemon vinaigrette. Sheldon follows suit with his own version of a fried brussels sprout salad and wins a coveted chef’s coat. Belgian chef Bart Vandaele, who is also a knight, gets by with lobster and bacon with some asparagus and beets. Red headed baby cook Danyele “with a Y” McPherson slips through with “propaney” tasting grilled tomatoes. The only cast-off here was Gina Keatley, self proclaimed tiger woman whose over-cooked zucchini and weighty salad got her the boot. Gina disagrees. She says she’s not just a chef and nutritionist; she’s a movement. Too bad she didn’t move them zucchini off the grill early enough. Note to self. When in doubt, throw them veggies in the deep fryer. Either that or serve some lobster and pork belly with some greens and call it a salad. Moment of the evening. Bart raised his arms in celebration as Gina starts to do the walk of shame. The joy of victory/agony of defeat in one shot. Heartwarming moment. Wrapping up service at Tom’s kitchen. 4 chefs left. Arguably the most important service of their cooking career. What does Chubby cook do? Stands around and look bored. If Tom Colicchio thinks you’re timid, chances are you’re not Top Chef material. The word Chef is derived from the word Chief. To be a chief in the kitchen means you’re a leader of the team. There is no such thing as a timid leader. Spoiler alert: Chubby cook doesn’t get a name. Mustache guy’s beurre fondue is too salty. You know you’re in trouble if Tom asks with a furled brow, “Did you taste this?” Spoiler #2: Apparently there can be only 1 mustache guy this season, and you my friend, don’t look like Kevin Gillespie. Always skin your red peppers! Service is over and it’s judgment time. Lizzie Bender (Accent cook) knows how to make tortellini and risotto. If you can make Tom happy with your risotto, you’re a force to be reckoned with. She could be a dark horse in this fight. Blue coat for her. Micah Fields (Ethnic cook) can’t butcher fish, but he knows how to cook a duck. 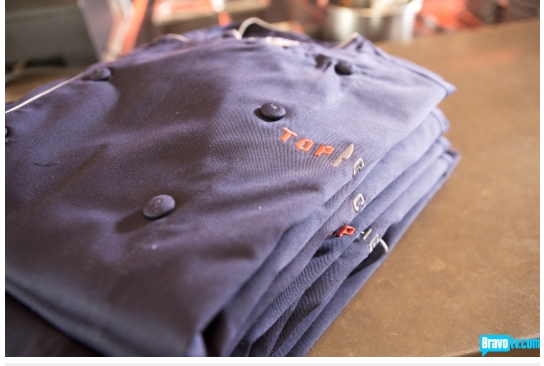 His aggressiveness around the kitchen and being comfortable in the element earns him a blue coat. There you have it. 15 out of 21 cooks survive the prelim. -Anna Ferris is pregnant, and the bearded guy from Parks and Rec is funny. -Joshua Valentine actually morphs into Kevin Gillespie. -Carla Pellegrino makes loud and dramatic gestures. Feel free to follow me on twitter @ChezWu!